Recently Pakistan Cricket Team Captain Shahid Afridi given a Interview to a Pakistani Tv Channel Samaa Tv in which he said that Allah has given Muslims Bigger hearts than others and Pakistanis are largehearted. After these comments of Shahid Afridi Indian Media started massive Propaganda against Shahid Afridi. Indian Media has old habit of lying, Misquoting and creating fake stories and this is what they done with Afridi's Comments. Indian Media claimed that Shahid Afridi has said that Indians have small hearts while hearts of Pakistanis are bigger than Indians. One Indian News Channel also lied that Shahid Afridi has given this comment after he was threatened by Taliban. Pakistani Captain has now given Clarification about his comments that he is Misquoted and i not said anything wrong about Indians. 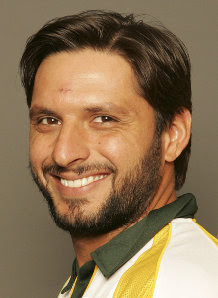 Afridi also said that i got lot of Love in India.